The Israel Museum, Jerusalem, is ranked among the world’s leading art and archaeology museums. While modest in numbers, the IMJ cuneiform collection displays a rich tapestry of Ancient Near Eastern written traditions: Sumerian, Akkadian, Elamite, Hittite, Urartian and Old Persian. Thanks to a legacy of gifts and generous support from its circle of patrons worldwide, the collection comprises clay tablets, cones and bricks, as well as stone and metal monumental artifacts, figurines, vessels, weaponry and cylinder seals. Examples include: 3rd millennium BC inscriptions of the Old Akkadian King Naram-Sin, exquisitely modeled foundation artifacts of Gudea of Lagash and unique Ur III administrative accounts; an early 2nd millennium BC rock relief of King Iddin-Sin of Simmurum and Old Babylonian mathematical, medical and school texts; and 1st millennium BC documents mentioning royal names and events described in the Bible, such as a spectacular historical narrative of the siege on Jerusalem carefully inscribed on an early 7th century BC prism of King Sennacherib of Assyria. Close collaboration between Laura A. Peri, IMJ Curator of Western Asiatic Antiquities, Ludék Vacín of the Max Planck Institute for the History of Science, Berlin, and CDLI staff at UCLA resulted in the cataloging, imaging and electronic processing of the collection in the summer of 2012, in accordance with the procedures and methods described in the pages of the CDLI. 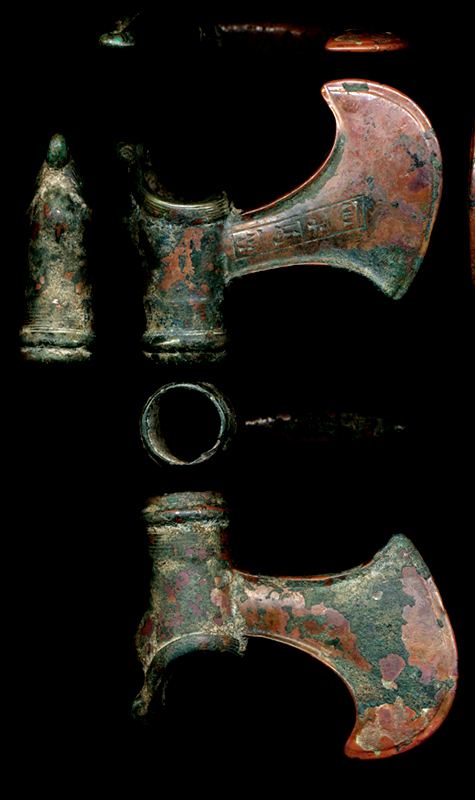 The object to the right (IMJ 76.60.34) is the axe head of Atta-Ḫušu (ca. 1900 BC); the exquisite state of preservation of this bronze artifact once owned by an ancient Iranian nobleman (probably the same as the donor of a wind bell in a Geneva collection) is matched by only a handful of pieces worldwide. Click on the image to be directed to the text’s corresponding CDLI page.